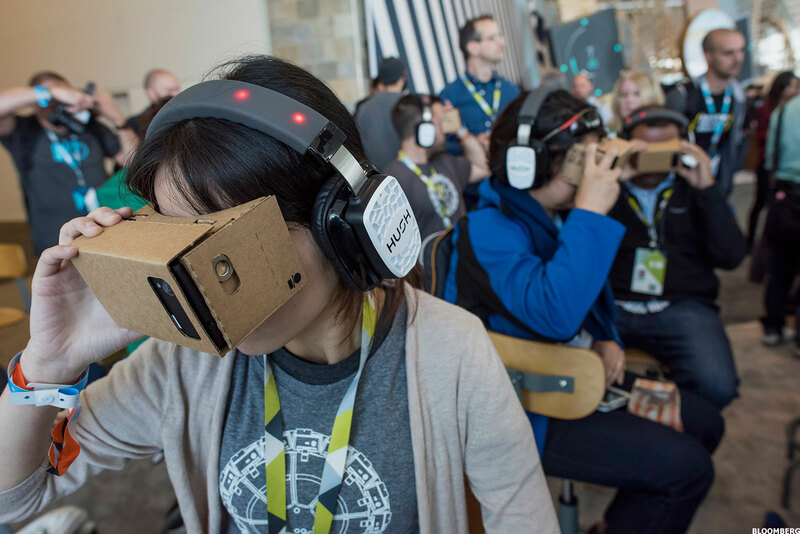 Could Virtual Reality Change Education Forever? Samsung's Gear VR and Google Cardboard may help virtual reality's fastest-moving applications become education. Virtual reality may be seen by some as the next best thing in the gaming industry, but one of virtual reality's fastest-moving applications may be within education. It's already broken into classrooms within the past few years with devices like Samsung (SSNLF Gear VR and headsets such as Google (GOOG - Get Report) (GOOGL - Get Report) Cardboard, meant mostly for taking children on virtual field trips and visualizing complicated concepts. But the release of these affordable devices -- Cardboard can be used with most existing phones with a $20 viewfinder and Samsung's VR device retails for $99 -- may mean virtual reality is about to expand past field trips and into other realistic educational experiences, such as classes, one-on-one meetings with teachers or the ability to practice speeches in front of virtual people. "The time of low-cost VR is already upon us, and I expect VR to become a more salient part of our everyday lives as devices continue to develop in the coming months," Stanford professor and virtual reality researcher Jeremy Bailenson said. "The biggest question that VR faces is in content creation, which currently is expensive and time-consuming." However, some experts urge patience, saying innovative technology within classrooms is only as good as the teachers who use them and the training they're provided -- both of which is currently limited. Alphabet's Google rolled out Google Expeditions, its education-focused virtual reality curriculum, last year to a selected group of schools for its pilot program. Expeditions itself is a 360-degree field trip where students are transported to common environments such as U.S. zoos or impossible excursions such as 1770s Philadelphia or the rugged landscape of Mars. "The oos and the ahs that were coming out of their mouths ... It's just amazing; it's such a cool way to teach," said Fremont, Calif.-based French teacher Kerrie Chabot, who used Google Expeditions to show her class Versailles rather than using online images. "I'm sure they'll retain it better." Chabot is among teachers who are fundraising to get virtual reality headsets for their classrooms so they'll be poised when Expeditions is available to the public -- right now it's only available via Google's pilot program, which is a beta of sorts. As consumer virtual reality devices less than $100 start hitting shelves, the possibilities for virtual reality within schools can be seen in academic literature. In Jeremy Bailenson's Virtual Human Interaction Lab at Stanford University, students use virtual reality devices to listen to an avatar's lecture in a simulated classroom. The classroom itself -- complete with noisy cars passing by windows and distracted students in some simulations -- tricked students' brains into believing the lesson was so real that an excess of distracted avatars caused the real subjects to pay less attention in class, much like how a class clown will peer pressure someone to kid around more during lectures. The findings show that not only do students' brains accept the virtual reality classroom as real instruction -- a powerful ability if students one day are able to stream into classes in other districts or other countries through virtual reality -- but they can be swayed by avatars they know to be fake. His research also showed that virtual reality could be used to make a student whose desk is in the back of a classroom feel like he is sitting directly in front of the teacher, an experience that increased focus. "Virtual humans are powerful. In dozens of studies we have shown that people respond to avatars in ways similar to actual humans," Bailenson said. Alchemy Learning, a job skills training company that is testing virtual reality in a beta phase, goes one step further to use digital humans to give feedback when someone is using their technology to practice a sales pitch or a job interview. If the person starts to stumble, the avatars will react differently than if the person is acing the presentation. "It allows us to create more life-like simulations," said Henry Blue, co-founder of Alchemy Learning. "Your body starts to believe you're in that experience and adds the sense of urgency." Alchemy uses Samsung's virtual reality headset for their product, Blue said. Products like Facebook's ( FB - Get Report) Oculus Rift were a bit too pricey, and Google Cardboard didn't have the right visualization for the product. "It's about finding the balance between affordability and the experiences," he said. Even with students being whisked off to Mars on a virtual field trip, experts say it will take time before every student can tap into the potential of these devices. "Virtual reality has hit a point where it's becoming cheaper literally as we speak. ... Just because people have access to better devices doesn't necessarily mean there is equity in the information they receive," said Sun Joo "Grace" Ahn, a University of Georgia assistant professor of advertising who studies virtual environments. "If we're able to get the devices out to people, we'd have to be able to support it with the content that goes with it. Just having a cool device isn't going to do anything. Just because you give your grandparents the most recent iPhone, it doesn't necessarily mean they're going to get the most experience out of it." Chabot said there hasn't been teacher training available for virtual reality at education conferences, but she hopes the increasing popularity of the devices will change that. There's also physical limitations. Virtual reality devices aren't meant to be worn for more than about 20 minutes at a time due to eye strain, Bailenson said. In general, the release of commercial virtual reality products has education researchers buzzing, schoolteachers talking and innovators working. "Every single week, there's some new technology that I read about or I talk with someone that they're working on that I couldn't have imagined existed the week before," Google product manager Ben Schrom said, who works on Google Expeditions. "It's such a green field for innovation."